3. 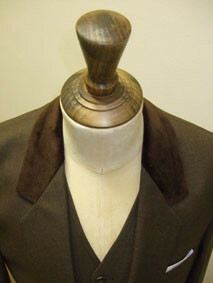 A very simple coat style complemented by a waistcoat. See also: bespoke suit, Bespoke Tailoring, bespoke tailors, cloth, coat style, England, fabric suppliers, Henry Herbert, London, London Tailor, Savile Row, Savile Row Suits, suit, tailor, Waistcoats, wedding, Wedding Suit. 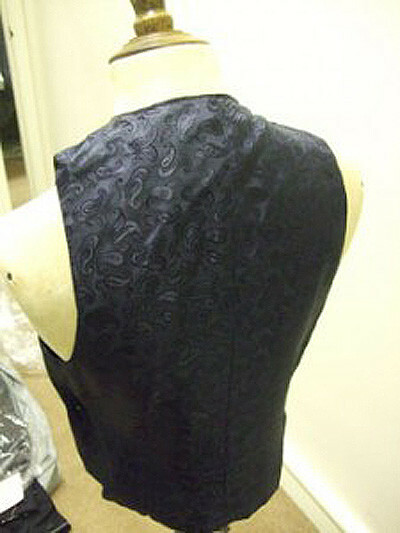 Bespoke Waistcoat for a Bespoke Band! A great looking waistcoat we made, using a rare fishtail lining for Freddie Smith who, with Phil O’Farrell, is part of the band Freddie Smith & Phil O’Farrell. (We made Phil a great looking shirt too, which you can see under our shirts section). 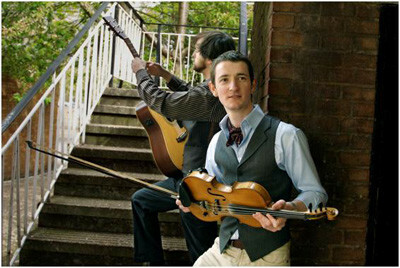 They play uplifting Irish inspired tunes and you can listen to some of their music on their MySpace account here. 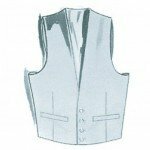 See also: amp, Bespoke Tailoring, celtic fiddle, fish tail, fishtail, Freddie, Freddie Smith, Henry Herbert Tailors, Phil, Phil O'Farrell, savile row tailor, savile row waistcoat, Shirts, Suits, Tailored Suits, tailored waistcoat, tunes, Visiting Tailor Service, Waistcoat, Waistcoats, wedding suits. 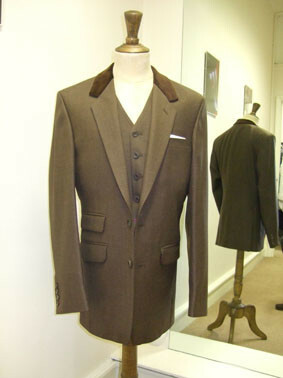 An extremely rare breed of suit – brown. It is made even more rare by the special velvet trim collar and made even more special by the very difficult sewing surround of the last cuff button! (The colour matches the lining). This was an incredibly difficult three-piece suit, which took Henry Herbert 37.5 hours of tailoring to complete, but well worth the toil. The fabric is a splendid Super 100’s wool from Holland & Sherry. See also: bespoke suit, Bespoke Tailor, Bespoke Tailoring, breed, Henry Herbert, Henry Herbert Tailors, Holland, Holland & Sherry, holland amp, London Tailor, Savile Row, Savile Row Suits, savile row tailor, Sherry, Shirts, suit, Suits, Tailored Suits, Three Piece Suit, Waistcoast, Waistcoats, Wedding Suit, wedding suits. Wow – what a waistcoat! 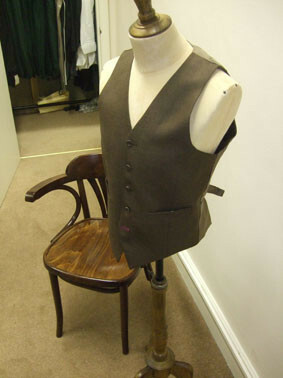 A special brown waistcoat, made even more special by the very difficult sewing surround of the last button! (The colour matches the lining). This was part of an incredibly difficult three-piece suit that took Henry Herbert 37.5 hours of tailoring to complete, but well worth the toil. The fabric is a splendid Super 100’s wool from Holland & Sherry. See also: Bespoke Shirts, Bespoke Suits, Bespoke Tailor, Bespoke Tailoring, bespoke tailors, Henry Herbert, Henry Herbert Tailors, Holland, Holland & Sherry, holland amp, London Tailor, Savile Row, Savile Row Suits, savile row tailor, sewing, Sherry, Tailored Suits, Three Piece Suit, Visiting Tailor Service, Waistcoast, Waistcoat, Waistcoats, wedding, Wedding Suit, wedding suits. See also: Bespoke Shirts, Bespoke Suits, Bespoke Tailoring, bespoke tailors, cloth, Double Breasted Suits, England, example, Henry Herbert, Henry Herbert Tailors, London, London Tailor, piece suit, Savile Row, Savile Row Suits, savile row tailor, service, style simple, tailor, Tailored Suits, The English Cut, Trousers, Waistcoast, Waistcoat, Waistcoats, wedding, Wedding Suit, wedding suits. 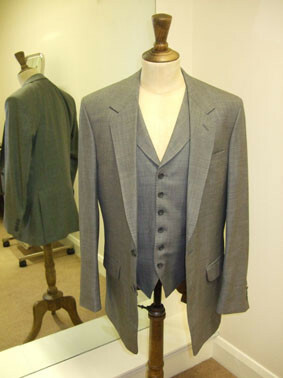 A Henry Herbert three-piece suit for the wedding of Mr Steve Hunter. Mr Hunter is a Cardiothoracic surgeon in the North West of England and is a fascinating professional to converse with. We chose a glorious fabric from Hield, a Huddersfield based mill and one not a million miles away from where Mr Hunter works. See also: A Henry Herbert, bespoke suit, Bespoke Tailoring, bespoke wedding suit, cardiothoracic surgeon, England, Henry Herbert, Henry Herbert Tailors, Mr Hunter, Mr Steve Hunter, North West, savile row tailor, Shirts, suit, Suits, Tailored Suits, tailored wedding suit, Waistcoats, wedding, Wedding Suit, wedding suits. Henry Herbert was invited to make a morning suit and waistcoat for the gentleman pictured above – a young lawyer from London, who married in the South of France. We chose the traditional trouser cloth from Bateman & Ogden (a Yorkshire mill) and the cloth for the coat and the waistcoat was made by Dugdale Brothers, of Huddersfield. A great looking morning suit to match his splendid looking bride. See also: bespoke suit, Bespoke Tailoring, cloth, France, Henry Herbert, Henry Herbert Tailors, London, morning suit, Ogden, savile row tailor, Shirts, Suits, Tailored Suits, Waistcoat, Waistcoats, wedding suits, Yorkshire, young lawyer. 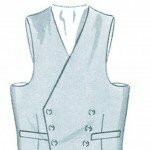 As bespoke tailors, Henry Herbert can offer any cut and style of waistcoat you wish. However, we have found that the styles below tend to be the most popular. 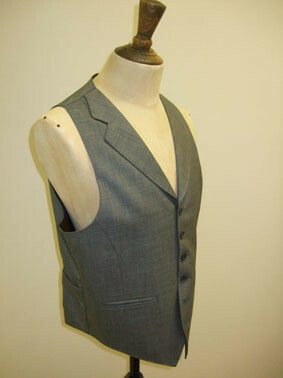 The Pocketwatch Waistcoat is very similar to the Oscar Lafontaine Waistcoat (see below) with the exception of its pockets, which were originally designed to accommodate a pocketwatch or a stopwatch. 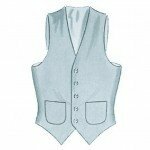 waistcoats have clean symmetrical lines defining their shape, but the Edwardian Line has a sharp line punching through the area around the tummy – a provocative but subtle style reaction to the King’s favourite. 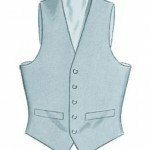 The horse shoe sccop waistcoat is designed to be worn with a black tie. The low slung body hides it discreetly behind a buttoned dinner jacket and tuxedo shirt, but quickly reveals itself when the jacket is unbuttoned. It should be worn without a cummerbund and the waistcoat buttons should remain fastened throughout the evening. 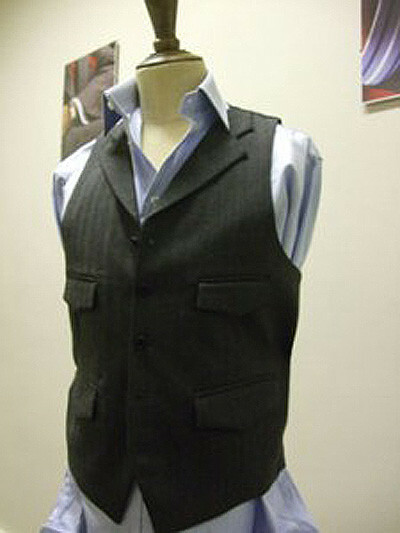 The Lounge waistcoat was once always a key characteristic of the three piece suit, but today it has been adopted as a popular choice amongst the youth of Britain, such as the style icon Kate Moss and the members of indie band Razorlight who wear them over casual shirts and jeans for a day-to-day fashionable look. Oskar Lafontaine is a German politician and former German Finance Minister. During his short tenure as Minister of Finance, Lafontaine was a major bogeyman of UK Eurosceptics. He is famed for always wearing a waistcoat, with two large, front pockets and five buttons, thus the Oscar Lafontaine Waistcoat. See also: Bespoke Shirts, Bespoke Suits, Bespoke Tailoring, bespoke tailors, Britain, Edward, Henry Herbert, Henry Herbert Tailors, Kate Moss, Line, Minister. During, Oscar Lafontaine, Oskar Lafontaine, savile row tailor, Tailored Suits, UK, Waistcoat, Waistcoats, wedding suits. 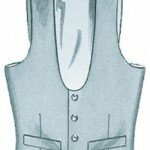 Waistcoats Archives - Bespoke Suits By Savile Row Tailors.